To explore Bratislava, use the Eventland App – where you can find up-to-date schedules of concerts, cultural exhibitions, festivals, flea markets, sports events or parties. All the happenings, events in the city in one place and in the English language. The app is very easy to use, with simple swiping, and you also have the option of creating your personalized lists of favourite events, and to create a personalized map of events that you plan to visit. And for a focused search that will save your time, you can filter by date or category to find what interests you the most. Eventland App is downloadable for iOS and Android. Mama’s design & boutique Hotel in a wider city center of Bratislava offers you a private undisturbed environment to host your meeting or event. Mama’s is located in the heart of a quiet residential district of Bratislava, only 15 minutes’ drive from the M.R. Stefanika airport, or a 15-minute walk from the main train station. The hotel holds 15 luxurious Superior and Executive rooms furnished with style and class, in a modern design that suits the most demanding needs for leisure travellers as well as for the business visitors. The hotel meeting room features a capacity to host up to 12 people. With the versatile modification of the room set up, it is ideal for hosting a business meeting, small family celebrations, dinners and other events that desire privacy. In the heart of Bratislava, you can find a bar with a unique concept – The Virtual Reality Gin&Tonic Bar. Located on Panenska Street near Hodzovo Square in Bratislava Old Town, easily to reach on foot or by public transport from basically any point in the city centre. The cozy bar is perfect to host teambuilding, incentives or to just meet your favourite colleagues for a glass of high-quality Gin&Tonic with a good dose of an adventure into the world of virtual reality by your choice. 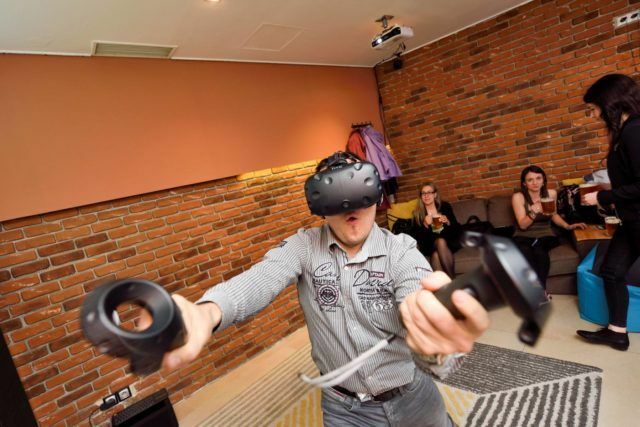 Action games, funny experiences, dancing games, artistic and adrenaline experiences and also simulations where you have to get over the fear and many more are waiting for you behind the VR headset.